The Paddington-born forward was a former QPR trainee who started and finished his career with non-league Wycombe Wanderers. 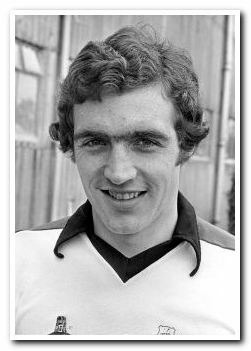 Making his Isthmian League debut for The Chairboys in 1973/74, Perrin went on to make 78 league appearances, scoring 34 goals in two seasons, with a further 15 goals in cup competitions. It was this form and a run to the third round of the FA Cup that prompted former Argyle manager Malcolm Allison to take a chance on bringing him to the Football League. The gamble paid off and in a two-year stay at Selhurst Park, Perrin played 48 times for Crystal Palace, scoring 11 goals. After Allison's sojourn in Turkey with Galatasaray, he returned to Home Park for his second spell as Argyle's manager and immediately brought the forward to the club. Whilst barely at Home Park for 18 months, Perrin's appearances and goals stretched over three seasons, but after making just one league appearance from the bench at the start of his third season in Devon, he moved to Portsmouth. At Fratton Park he played 28 times, scoring just three in a three-year spell. He then drifted out of the League, signing for Hillingdon Borough in 1981. A brief return to the League with a non-contract spell at Northampton Town yielded 22 appearances and five goals before he returned for two successful seasons with Wycombe Wanderers, playing a key role in the 1983 Isthmian League championship season. He then saw out his career with a second spell with Hillingdon Borough and then St Albans City. After retiring from football, Steve Perrin became a primary school teacher. He worked for many years at Bushey Heath Primary School, where until recently, he was the head teacher.